With more than 80% of total mobile phone usage time being spent inside apps, you can’t afford to ignore any opportunity for in-app marketing. Additionally, people now spend more time online from their mobile devices than any other digital device. Considering these stats, it’s clear that a strong mobile strategy should be important to any digital company. However, when you look at the current tools available to marketing, support and success teams it feels like mobile customer marketing is still an afterthought in many ways. When a customer is using your app it’s prime time to engage them. They’re already thinking about your product and enjoying the idea of it’s benefits; so what better time to help them move through the customer journey and ultimately make a purchase. Currently if you want to engage customers in-app, you’re limited to only sending text messages. While this is better than no messages at all, it struggles to drive purchases and lack the ability to produce a proveable RoI. These marketing programs are valuable and the platforms that power them provide abilities previously unavailable to marketers. However, these tools are only half of the solutions marketing, support and success teams need today. It’s everyone’s job in a company to increase revenue and lifetime value, and messaging can only go so far in achieving that objective. Furthermore, due to overwhelmed mobile development teams, in-house development of marketing or support initiatives is essentially unheard of. Even the simple idea of running a marketing program that rewards first time app usersis off the table for all but the biggest companies. When we think about special offer marketing, especially inside a mobile app, it’s crucial to think of the customer journey. When a customer first downloads your app the incentive program is very different than the special offer required to activate them, to drive a referral or retain them. SaaSquatch can help you run marketing programs that target every part of the customer journey all the way from first download to reactivation. We will cover a few examples in this article and if you want to know more please visit SaaSquatch.com. As mobile marketers we know that acquiring new users is of extreme importance. However, we also know that there is a lot of competition. While tools like Branch Metrics and other deep linking tools can give you insight into where new users came from, you can’t go that extra mile to “sweeten the deal”. Getting a customer to download your app is just the start of their journey with you and your product. Once they’ve downloaded the app you need them to make a purchase. However, most consumer business need people to make more than one purchase before they’re hooked and become a regular customer. With the SaaSquatch Repeat Purchase Reward program you can now reward customers for making a specific number of purchases in any given time period. An example of this would be if you ran an on-demand service and wanted to help activate new users. You could create a program that gives new users $50 credit if they make 3 purchases over $10 in their first 30 days as a customer. Another highly effective program to consider for active customers is a refer-a-friend program. 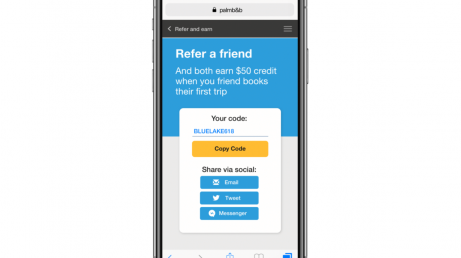 Unlike an organic share message, a customer referral program lets you reward both current users and new users with special offers. With a SaaSquatch refer-a-friend program you can engage your existing customers in-app, online or by email to encourage them to make referrals. When a user makes a referral their friend is automatically tracked through the download and potentially first purchase stage. After the required conditions are met, the rewards are released for both the new and existing customer. These are just a few of the marketing programs possible with the SaaSquatch platform. New programs are added regularly and super users can even create custom programs all on their own. Keep coming back to find out more. Click here to learn more about how SaaSquatch can help you grow your mobile app.